UNITED NATIONS, February 7 -- As in Washington the House of Representatives prepares to vote on a proposal to have the UN return hundreds of millions of dollars to the US, in New York the UN is refusing to answer simple questions about how much money is at issue. Meanwhile it has emerged that for fully $100 million of the so-called Tax Equalization fund, the US Mission or US State Department told the UN to use it for security. To some it is unclear if this donation -- or “ultimate earmark,” as we are calling it -- was done legally or transparently. The question now arises, how did the US Mission or State Department give the UN the approval to “repurpose... up to $100 million,” even if ostensibly for security of the UN in New York City? Inner City Press: there is this proposal in the House of Representatives by Eric Cantor [Republican-Virginia] and others to ask for a refund from the UN tax equalization fund and also from closed-down UN peacekeeping operations. I wonder if, I mean this is on — it’s not only on their website, they said they are going to bring it to a vote. Is there some way to know how much is in each fund and also what does the UN think about this open call by the host, in the host country’s parliament, I guess, to have this money returned? Acting Deputy Spokesperson Haq: Well, first of all, it is not by the host country’s parliament at this stage. This is something happening within a parliamentary body, if you will. And we don’t comment on processes as they work their way through the legislative system. So we leave it to the legislature of the United States to work out this particular matter. Inner City Press: Is it possible to know how much money is in each, just objectively, in each pool…? Acting Deputy Spokesperson: Yeah, I believe my colleagues in the Department of Peacekeeping Operations are looking into that matter. But three days later not even an estimate has been provided. Inner City Press: There is a discussion in Washington, although admittedly on probably more among one party than another about recouping funds from the UN. And I just wanted to, I understand that that’s something that’s taking place in Washington, but the numbers that they are using, they are saying there is $243 million in funds from closed peacekeeping operations and $180 million in this thing called the tax equalization fund. And I just wonder, is that something… can the UN… I’ve been trying to get this… Can they confirm that those were the numbers? And if they can, if there is some argument of why none of this should be returned, it would be good to hear it, but I just want to make sure if those are the numbers, the numbers being thrown around down there, are in fact the numbers accepted up here? Spokesperson Nesirky: I think we will be able to give you some numbers a little bit later today. How was the referenced money “repurposed”? Did the US Mission or State Department indicate how it could be repurposed? How? What other countries have allowed extra budgetary money to be similarly repurposed and how much? Do the UN Secretariat agree with the State Dept that it is not possible to refund monies to the US from the Tax Equalization Fund? How was the $100 million referenced in Esther Brimmer's quotes spent? Is it possible for funds to be reimbursed to the US from the UN from the closed peacekeeping accounts? 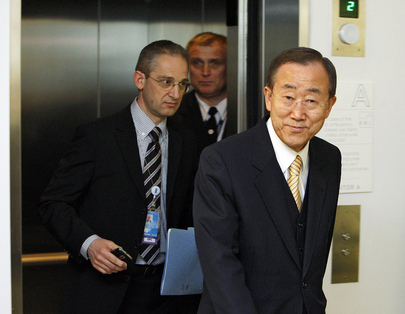 UNITED NATIONS, January 25, updated -- In the run up to UN corruption hearings in the US House of Representatives today, Secretary General Ban Ki-moon angrily answered questions about lack of transparency by claiming that 99% of his officials publicly disclose their finances. This is not true, as Inner City Press has said and now documents. On the UN's website for such disclosures, numerous Ban officials simply state “I have chosen to maintain the confidentiality of the information disclosed by me in order to comply with the Financial Disclosure Program.” This is not public disclosure of finances: it is its opposite. Those Ban officials refusing make even the most basic disclosure -- as simple as in what country they own property, such as the one line disclosure by top UN lawyer Patricia O'Brien that she owns “farmland, Ireland” -- ranging from both of Ban's envoys in Sudan, Ibrahim Gambari and Haile Menkerios to UN officials with outside jobs that might conflict, such as Terje Roed-Larsen (Lebanon and IPI), Peter Sutherland (migration and BP) and Ray Chambers (malaria and hedge funds). There are other ways to not disclosure. Philippe Douste-Blazy, whom Inner City Press has exposed as wasting millions of dollars through the “MassiveGood” scheme, discloses no finances, only service for the Millennium Foundation. Alexander Downer, Ban's man on Cyprus, makes no financial disclosure although he lists he works at the business consultancy Bespoke Approach. And do its clients, in Turkey for example, raise conflicts? There is no way to know. Ban's close ally and Cote d'Ivoire envoy Choi Young-jin states that “I have chosen to maintain the confidentiality of the information disclosed by me in order to comply with the Financial Disclosure Program,” as does Ban's UN Security chief Gregory Starr. These refusals are noteworthy given how superficial even the “public disclosures” are. Peacekeeping logistics deputy Anthony Banbury, who famously said that “only” three rapes in a Haitian IDP camp “elated” him, lists “Nil” for both assets and liabilities, as does General Assembly Affairs chief Shaaban Shaaban. Some officials are listed, but there is no link to any form, even one refusing to disclose. These include Achim Steiner of UNEP and former UN lawyer, still listed as adviser Nicolas Michel, who took money from the Swiss government for his housing while serving as the UN's lawyer. Since that scandal, there are issues about Ban officials receiving housing subsidies through their spouses, not disclosed on the “public” disclosure forms. Other Ban officials stating “I have chosen to maintain the confidentiality of the information disclosed by me in order to comply with the Financial Disclosure Program” include West Africa envoy Said Djinnit, Middle East and Lebanon specialist Michael Williams, UNDP Asia boss Ajay Chhibber (in charge, another other places, of Myanmar), Jan Mattsson of UNOPS, where Ban's son in law got a controversial promotion, and Cheick Sidi Diarra, whose brother has been Microsoft's Ambassador to Africa, allowed to use a UN dining room for this purpose. 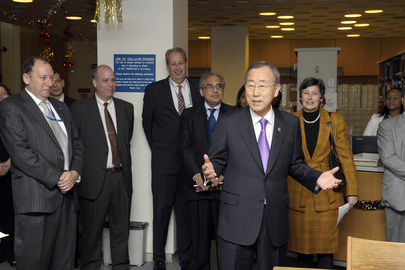 In another display of non - transparency, Ban's spokesman Martin Nesirky on January 21 told Inner City Press he would not answer any more questions until Inner City Press acted “appropriately.” This outburst came after Inner City Press asked for the second day in a row how UN Staff Regulation 1.2 applies to UN official's outside political activity. Ban named Jack Lang as his adviser on piracy, reporting to the Security Council today. But Lang continues to write letters as an official of a political party in France, for example regarding Ivory Coast (where, again, Ban's envoy Choi Young-jin refuses to disclose his finances). The UN has refused to apply its Regulation 1.2 to this or other case, or to even answer questions about it. One wonders how this will be dealt with at today's US House of Representative hearings and afterward. Click here for footage of Ban's claims from a recent piece on Swedish TV including Inner City Press and a hearing witness. Ban's main claim to transparency, the 99% of his officials make public financial disclosure, is simply not true, and his spokesman refuses to answer any questions. Watch this space. The United Nations has always worked constructively with the United States, and we share the same goals: for a stronger UN, one that is efficient, effective, and accountable. That is why the Secretary-General has made strengthening the UN one of his top priorities since taking office. The Secretary-General is convinced that a strong, effective and efficient United Nations needs the active and constructive support of Member States. To achieve that, he will continue to engage with the US Administration and with the US Congress on ways to ensure that the Organization can find solutions to today’s challenges, and deliver on the mandates given by it Member States. Ban Ki-moon is quoted by Bloomberg, which he sought out, that Congressional Republicans' "only complaint they may have is the lack of much faster progress than they might have expected.” What specific areas of "progress" was the SG referring to? Namely, which areas does the SG acknowledge not having met expectations and for which progress should have been made "faster"? Michael Dudley, the acting head of OIOS' Investigations Division, is under investigation, for among other things, retaliation and evidence tampering. Given that Ban Ki-moon says he prides himself on the transparency of his administration, what specifically are the facts surrounding the investigation process regarding Mr. Dudley, and will the UN be reassigning him to other duties during the investigation? UNITED NATIONS, January 23 -- Two days before hearings about problems in the UN of Secretary General Ban Ki-moon in the US House of Representatives, Ban's spokespeople refused to answer basic questions about the case against the UN's lead investigator and Ban's admitted delays in reform. Even on an African election Ban said he would be “following with anticipation,” his Spokesperson's Office refused to answer questions about the UN's role in irregularities in voting. This followed a January 21 threat by lead Ban spokesman Martin Nesirky to no longer answer questions from the Press rather than state how the Ban administration enforces the UN's own rules. Not only did Nesirky not answer these on January 22 - he and his deputy Farhan Haq also ignored the questions on January 23, when posed in relation to the upcoming House hearing, failing to even acknowledge the questions. The Secretary-General will be following with anticipation the presidential and legislative elections due to be held on 23 January in the Central African Republic... The United Nations Integrated Peacebuilding Office in the Central African Republic (BINUCA) and the UN Country Team have been working with the Central African authorities to help consolidate peace in the country. More than six hours later, the question about breaking news of irregularities in this election Ban was supposedly “following with anticipation” was not even acknowledged. 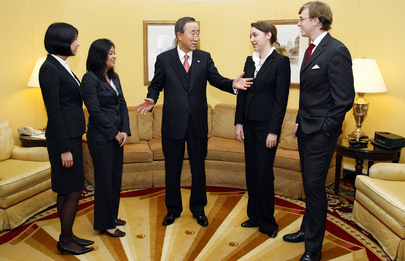 This is the UN of Ban and his staff, including Nesirky. The hearings are brewing in DC. Watch this site.